Main Horn ( KTC ) has been supplying quality suspension and steering components to customers worldwide . 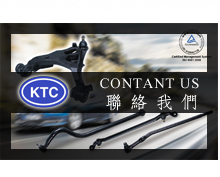 With one of the largest American ,Japanese and European selections available, Main Horn ( KTC ) offers a long list of tie rod ends, control arms, ball joints, suspension arm, rubber busing etc. Copyright © 2013 MAIN HORN INDUSTRIAL CO.,LTD / KTC SUSPENSION COMPANY All rights reserved.